Colorful leaves flow across the canvas, seeming to drift on a gentle breeze. 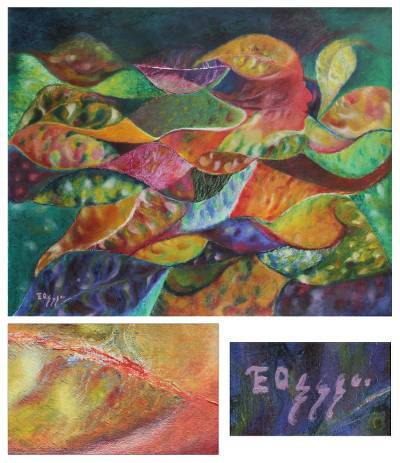 Conjuring sensations of harmony and peace, Theus explores color and texture. "The illusion that comes to mind when I see the leaves and flowers come to life around my little house is one of beautiful nymphs — their silhouettes and fragrance," the Andean artist confides. Titled "Aroma y perfume de una ninfa" in Spanish. You can find 'aroma and Perfume of a Nymph' (2013) by Theus in paintings categories such as Leaf and Tree Paintings, Abstract Paintings, Abstract Paintings and Oil Paint Paintings. Enjoy exploring these sections for other Novica treasures.